Note: This is my interpretation of Liquid, the WordPress Photo Challenge for the week. We’re supposed to share a photo of liquid in whatever state we’d like. 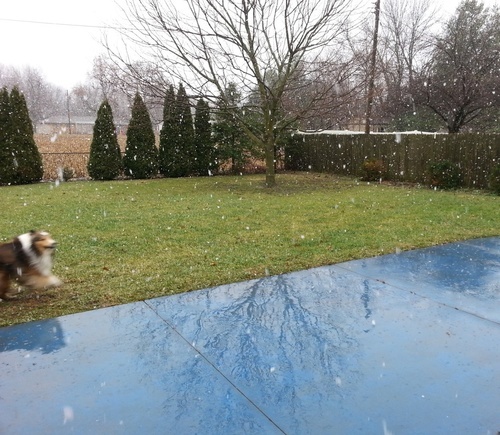 If memory serves me correctly, this shot from December 2014 captured one of our early snowfalls, and my dog gleefully joined me outside as big, fat flakes swirled down from the sky. *The “zoomies” are sudden bursts of crazy energy that are totally normal for healthy dogs. This entry was posted in Photo Challenge and tagged dog, Haiku, liquid, snow, wp Photo Challenge. Bookmark the permalink. Ha ha ha. Good one Debbie. Thank you, John. Just wait until Twiggy zooms around — it’s hilarious! She does. That’s what made me laugh. She’s starting young. Lots of happy years ahead! Thanks so much, Miss A. Glad you liked it! HA! I’ve never heard of that word, Debbie, but I must be a dog because snowfall causes me to act ZOOMIE as well! As you know, I LOVE snow! I’m glad you mentioned that this photograph was taken back in December because when I first saw it I immediately thought that you had a snowfall recently. Although, I don’t know why that would surprise me, considering that this Spring as been so strange and bipolar. Have a great rest of your week, my friend! HaHa, thank you, Ron! No snow here of late. I think Easter Day was our last snow, and even that seems late to me. We’ve been HOT — in the 80s — which I understand is perfect for growing corn. I’ll have to get a photo of some of that soon! Was HE able to herd any? :-) That would be quite an accomplishment. I was thrown off on the gender by skimming the conversation between you and John. Sorry about that. Understandable. John has three she’s, not Shelties, but still cute. Poor Dallas is always trying to herd something. He’s often successful at herding ME!! Heehee look at Dallas go! Isn’t he cute and blurry?!! If I hadn’t been so intent on capturing a snowy photo, I’d have thought to get a video so you all could hear him barking! Dixie Rose used to get the zoomies, too — usually at 3 a.m. There’s nothing that a cat at full tilt around and around the house, with an occasional over-the-sleeping-person in the bed to add to the fun. Still, Dallas gets the best of it, since he gets to play Zoomies in the snow! Okay, I will … thanks for the nudge! Oh, dear. Three in the morning?? That’s the part of cat-ownership I might object to! Dallas is deep in his snoozles at the hour, thank heaven!